Apparently, my vote counts. In a BIG way. To look at my inbox these days, you would think that I alone am going to be the deciding vote on just about everything in Tuesday’s election. So look out, fellow Americans, I’m carrying a lot of clout, if you ask me. Here’s how I know: I’m getting at least 100 emails everyday telling me whom I should vote for and whom I should vote against. Not to mention, where I should stand on the countless propositions on this year’s ballot. Of course, this doesn’t include the barrage of telephone and text messages, as well as postcards I’m receiving daily. So, is it just me, or is this election the biggest of the century—the only one that truly matters? Not a recent photo, but this is how I picture him looking when he calls me about voting. It seems a lot is riding on it and frankly, it’s got me stressed. The 24-hour news cycle has whipped me into a frenzy. I’m pacing the hallways of my little home, wondering frantically what will the outcome be? Which party is going to take the house? Which will control the senate? Inquiring minds want to know and cannot wait until Tuesday night to learn the answer. That is really unfair, if you ask me. I’m not the kind of person that likes to wait. “Impatient” should have been my middle name and, to all the pundits out there, you know what I’m talking about. And it’s not just the emails that have me in a tizzy. I’m also getting phone messages from none other than Robert Redford himself, which has me spinning out of control. Mr. Redford wants me to vote “No” on something. But I’m not falling for it. Nope. I’m not impressed. It’s a recorded message after all. 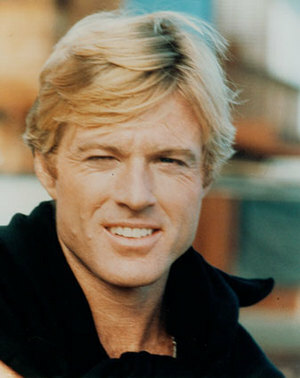 Now, if Mr. Redford called to personally speak to me, I would let him fill out my ballot for me. He’d have carte blanche. I’d invite him over for dinner and he could tell me exactly who and what I should vote for, and what I should think, for that matter. It’s those blue eyes and come hither looks. Yes, I’m a sucker for the Sundance Kid. In fact, I’ll just go ahead and write him in as a candidate for governor and senator. He’s bound to win with my vote. And if all the emails and phone calls weren’t enough to stress me out,there’s all the political ads that make me feel like I’m watching a train wreck or worse, a reality show, like “Fear Factor.” The way these politicians crawl all over each other, you’d think they were competing to win a million bucks, not a thankless political job. In these ads, candidates says scathing things about their opponents and if I were to believe everything they say, well then we have some pretty awful people running for office, if you ask me. The worst of the worst, bottom of the barrel folks. Well, the election will be over in less than 48 hours. At which time, I will no longer be Ms. Popular. My clout will be gone. Zippo. My email inbox will once again look deflated and woefully lonely, and my phone will stop ringing off the hook. I’ll probably never hear from Robert Redford again. Sigh. At least I have the next few hours to look forward to more emails, calls and the like. Until then, just do me a favor: don’t tell these folks I already voted. Psst, I mailed in my ballot weeks ago. After all, I’m too impatient to wait for Election Day to vote! How about you, have you voted? Well, if you haven’t, snap to it! I don’t know, Monica. I think I’d do whatever Redford tells me to do, even if it is a recorded message. And yes, I voted. Mailed in my ballot today. I can’t wait to vote. While not as hopeful as 4 years ago, I remain faithful to the causes and elected official I think with see us through these challenging times.